Live fire cooking, upscale libations, and Southern hospitality come together for an unmatched experience at long-awaited The Crunkleton Charlotte in historic Elizabeth. More than just UNC Chapel Hill graduates had been anxiously awaiting the opening of The Crunkleton Charlotte. More than 1,200 people had already paid the $10 annual fee to be a member of the private, members-only club—before it even opened its doors at 1597 E. 7th St. in mid-December. By New Years Day, that number had climbed to 2,000. 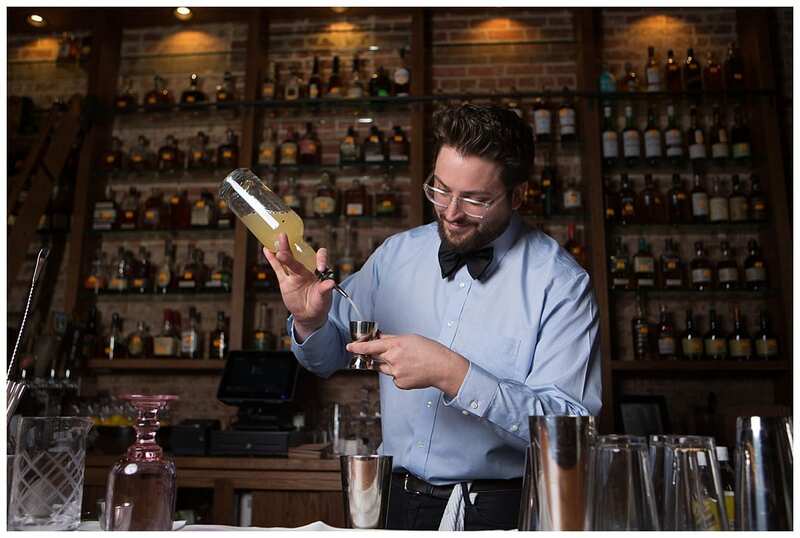 The hype started when renowned mixologist Gary Crunkleton opened his first bar on Franklin Street in Chapel Hill back in 2008. In the decade since, The Crunkleton has become one of the best-known watering holes not just in the Triangle area but also throughout the Carolinas and the entire Southeast. So when Charlotte caught word that Crunkleton was expanding to the Queen City, the buzz became a roar. From the bartenders’ mastery of classic 19th-century cocktails to the club’s cozy, intimate atmosphere in historic Elizabeth, it’s not hard to see why so many people fall in love with The Crunkleton from their first visit. Crunkleton partnered with local restaurateur Zach Goodyear to open The Crunkleton Charlotte, which has something the Chapel Hill location does not: cuisine. Executive Chef Greg Balch worked alongside chefs Cole Gray and Matthew Carnevale at Ratcliffe on the Green, before the beloved restaurant closed its doors on Tryon Street. In the years since, the three went their separate ways to pursue their craft at popular eateries around the city, from Sauceman’s to The Punch Room to The Workman’s Friend. Now, they’re back in the same kitchen once again, blending each of their culinary experiences and influences together as they collaborate on a totally unique menu boasting items that are all (yes, all) prepared using live fire cooking over an open hearth. At least one component of every item on the menu, from the 36-oz. dry-aged Tomahawk ribeye ($110—intended for the table to share) to the fried sugar toads ($16) and even the chopped salad ($14), makes it into the hearth at some point during its preparation. But don’t think that you’ll get stuck with a pricy bill every time. There’s something for every budget on the menu at The Crunkleton. “You could come in here and get a yourself Miller High Life and a burger, and you’re out of here for under $20,” says Goodyear. The Crunkleton Burger ($10) is, in Balch’s opinion, one of the most underrated items on the menu. The 1/3 lb. patty is comprised of short rib, brisket, and chuck, ground in-house. It’s topped with American cheese, lettuce, pickles, and Crunkleton sauce on an airy brioche bun, then served with fries. The no-frills burger seems to follow the same mindset as the cocktail program at The Crunkleton: You don’t mess with a classic, you perfect it. A few tried-and-true favorites include the Elderflower Sour ($12), created by Crunkleton himself, featuring London Dry Gin, elderflower liqueur, ginger cordial, lime, and cucumber; the Sazerac ($12) which blends Bonded Rye Whiskey, cane sugar, bitters, Herbsaint, and lemon oil; and the White Negroni ($14) made with Spanish Gin, Salers Apéritif, dry vermouth, orange bitters, and grapefruit oil. Not in the mood for a cocktail? You can also choose from more than 40 wines by the glass starting at $8 or bottles ranging from $32 to $90. You could also opt for a beer—either one of the 12 local and regional beers on tap or a bottle of domestic beer starting at $3.75. Whatever beverages (or plates) you decide on, you can enjoy them from one of the 18 luxurious leather chairs at the 30-foot oak bar, from one of the 54 seats around the low-top tables, or from a U-shaped yellow leather banquette against the back wall of exposed brick. Either way, you’ll have full view of the open concept kitchen’s modern teal backsplash and—more notably—the 9-foot-wide hearth and crackling fire, upon which your food will be cooked to perfection. For now, though, we will have to make do with visiting The Crunkleton in Charlotte and Chapel Hill for classic cocktails and (in the Queen City, at least) cuisine. To Crunkleton, though, those things aren’t what bring people back again and again. It’s the hospitality that’s so ingrained in the staff at The Crunkleton that has people clamoring to become members. ← Out on the Town: Here’s where some of the city’s top restaurateurs go out for date night.